Anyone who’s serious about their DIY work should own a practical tool such as an angle grinder. They’re used mainly for cutting various metal surfaces and they can help with other important processes, like cleaning up welds for example. The secret behind an angle grinder’s abilities is abrasion. With the right accessories, you can tackle a highly versatile range of tasks whether you wish to polish metallic objects or cut straight through iron rods. You might also be interested in our articles about the best band saws and the best detail sanders. A more powerful motor can be a huge help for some tasks, but don’t underestimate lower amp ratings because these tools are still reliable enough to handle most household jobs. Besides variable amp ratings that usually start at 4 and can reach up to around 15, there are also watts ratings to consider. In most cases, you can pick between 500 and 2,500 watts. Another indicator of the power of an angle grinder’s motor is the disc size. Some of the more popular sizes available on the market of angle grinders are 4.5-inch and 9-inch. There are many instances where having an angle grinder with a smaller disc size can be more advantageous and the best example is for smaller jobs that require extra precision. Having a powerful angle grinder doesn’t mean much if you can’t use it properly. This is why comfort matters and there are a few features that contribute to better maneuverability and simpler operation. Unless you’re planning on working on construction sites and tackle jobs on an industrial level, it’s probably best to go for angle grinders that are smaller and more portable. Vibrations can make your job less comfortable so that’s why you should also try to select a model that’s equipped with anti-vibration handles. If you plan on using the angle grinder for multiple different jobs, it’s always good to check the available wheels and accessories that can be fitted to your desired model. Those who value versatility should strongly consider getting the right accessories for their tool. There are a few important players in the angle grinder industry and their best models have been assembled here based on certain factors. The primary selection criteria used for making this list is cost-effectiveness. Let’s see which are the best angle grinders for your budget and specific needs. Porter-Cable is a very popular manufacturer of angle grinders and the reason for that is simple. Their products are affordable and reliable. A solid example of that is the PC60TAG model which boasts a powerful 6 Amp motor and a cast metal gear case. There are other features to be excited about in this 4.5-inch angle grinder. The motor of this tool can deliver a total of 11,000 RPM for handling the material removal on multiple DIY jobs. It’s not exceptionally performant, but this is more than you’d expect at this cost. One area where this angle grinder gets things right is the comfort. To simplify the maneuverability, this model comes with a side handle that can be positioned in three ways. Optimal positioning is also ensured with the help of a rotating housing feature. This ability also contributes to better user control no matter the preferred position. In terms of durability, this model is actually surprisingly sturdy for an inexpensive angle grinder. It feels resilient due to its solid construction all-around. A spindle lock feature is provided for convenient wrench bit changes and the thread size is 5/8 in. x 11. The tool is designed to be lightweight and offers good grip areas. As an extra convenience ability, the angle grinder comes with tool-free release guard that makes removing the guard simple. Safety is not really compromised as you can then align the guard to keep the correct way for the spark path. There’s no case supplied for storing the tool, but that’s already asking for too much at this price. Overall, the Porter-Cable PC60TAG offers excellent value for the money for an angle grinder. That’s the main reason why it makes it at the top of this list. It’s not really fitting for more heavy-duty tasks, but it’s a fairly versatile 4.5-inch angle grinder and is worth a shot if you’re looking to get your hands on a very balanced tool all-around. 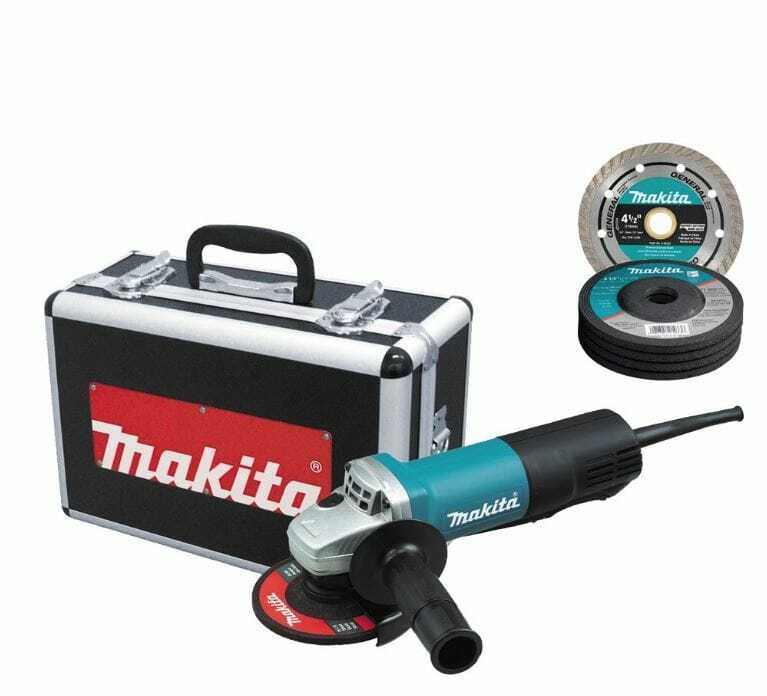 For those looking for a more complete package, the Makita 9557PBX1 is a well-built angle grinder that comes complete with a sleek aluminum case and other fancy accessories including 5 grinding wheels and one diamond blade. Let’s take a closer look at the abilities of this angle grinder. One of the most important characteristics of this type of tool is the performance. The 11,000 RPM output is quite solid for a 7.5-amp motor. The motor starts more smoothly thanks to the soft start feature. A good range of durability features is also available in this angle grinder. The motor and bearings of the angle grinder are designed with a labyrinth construction which boasts protective features against dust and debris. Another solid ability is the zig-zig varnish which offers the same level of dust protection for the armature. A comfortable operation is essential for an angle grinder. With a weight of only 4.5 pounds, this is an easy-to-handle unit. The paddle switch is large enough to make it more comfortable to operate and the tool can work continuously when you activate its lock-on ability. There’s a side handle provided which you can place on the side of the angle grinder that’s more convenient to you. Clamping is achieved with the help of quick wheel guard adjustment. This is an angle grinder geared toward users who prefer a more versatile unit, as evidenced by the ability to handle a vast range of jobs, including polishing and grinding. Considering that this is a kit which also comes with all the necessary accessories for a comfortable DIY working experience, the Makita 9557PBX1 is clearly a winner on the market for angle grinders. It’s engineered for smooth cuts and finishes, delivers the tool housed in robust metal gear, and doesn’t disappoint when it comes to comfort. Highly recommended. 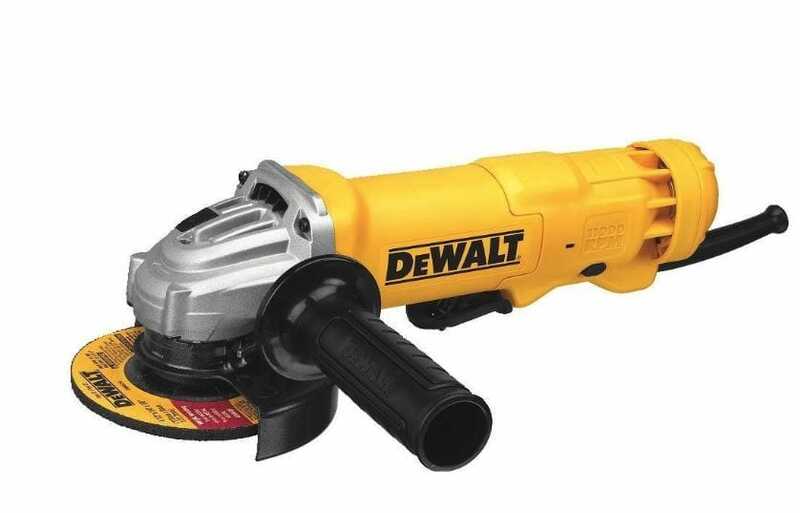 Anyone who’s searching for a great small angle grinder should check out the DeWalt DWE402. This model comes with many features for boosting your productivity and to ensure the best durability of your tool. It also has some solid abilities to simplify the entire operation process so let’s take a closer look at it. Even though this is a small angle grinder, it seems it’s able to pack a considerable punch thanks to its 11-Amp AC/DC motor which can reach an impressive 11,000 RPM. When you factor in the weight, that’s a lot of power to work with. The small gripping surface enables the user to handle the tool more comfortably. Comfort is balanced nicely with durability in this angle grinder. The side handle is ergonomically designed while oversized threading has a good contribution to the overall sturdiness. An increased transmission life is achieved with the help of a large spiral bevel gear. The Dust Ejection System gives the tool the ability to stay protected from damaging dust particles or other debris that can affect the grinder’s operation. Some great features that help you to get the most out of your small angle grinder are included. A good example is the One-Touch Guard which permits 360-degree rotation for targeted action. The depth-of-cut is maximized by using the spindle lock which is safeguarded for durability. Speaking of safety, this model comes with a lock-off on its paddle switch to avoid any accidents. There’s no need to rely on a wrench when it’s time to remove the wheel. 4-1/2″ is the diameter of the wheel and with the help of matching wheel flanges, you can add some useful accessories. 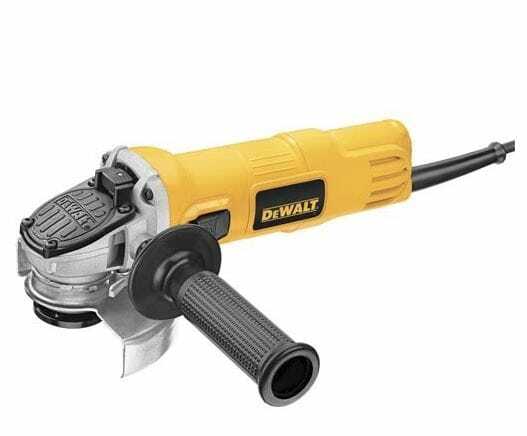 A great angle grinder overall, the DeWalt DWE402 is strongly recommended for those who favor a smaller unit without making compromises on performance and durability. The vibration is kept within reasonable levels and overall, the action is very smooth. It’s a little more expensive compared to other models on this list, but the superior quality is noticeable. Hitachi is a well-known manufacturer of power tools and their angle grinders are very appreciated for their comfortable operation and durable construction. A fine example is the G12SR4 model which promises superior reliability, an easy-to-use way to make accessory changes, and improved control when dealing with various grinding jobs. This unit features some improved features over the previous models. 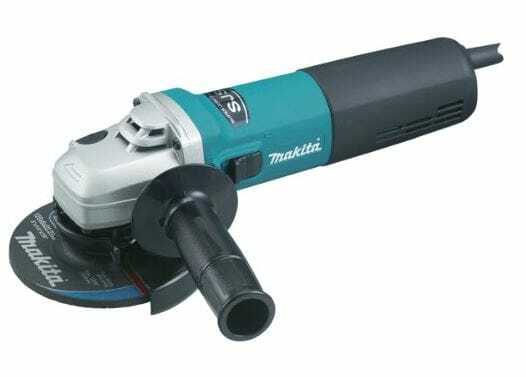 The performance is a defining factor for any angle grinder and this one seems to be able to tackle most jobs in its class considering the 6.2 Amp motor. For the motor, the manufacturer optimized the design to enhance the efficiency of the cooling process. Control is another important aspect when using an angle grinder. This unit comes with a smaller grip diameter that can really show some benefits with continuous use because it can minimize fatigue and improve your precision. Another detail that offers some contribution to the overall comfort is the trigger lock-on. 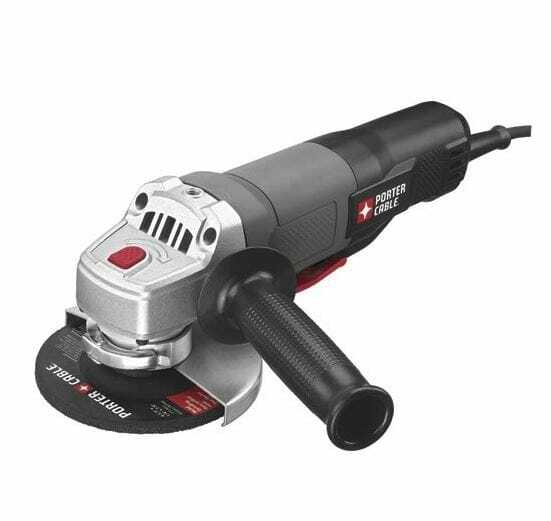 To make some fast wheel changes, this 4-1/2 inch angle grinder offers a spindle lock. The side handle can be removed and placed on the side that’s more comfortable to you. This angle grinder is simple to maneuver considering the low weight of 4 pounds and it’s also very compact, ideal to be used in overhead applications. Better overload durability is another solid ability of this angle grinder. Dust and debris shouldn’t have damaging consequences to the tool thanks to a special labyrinth design which should prevent it. 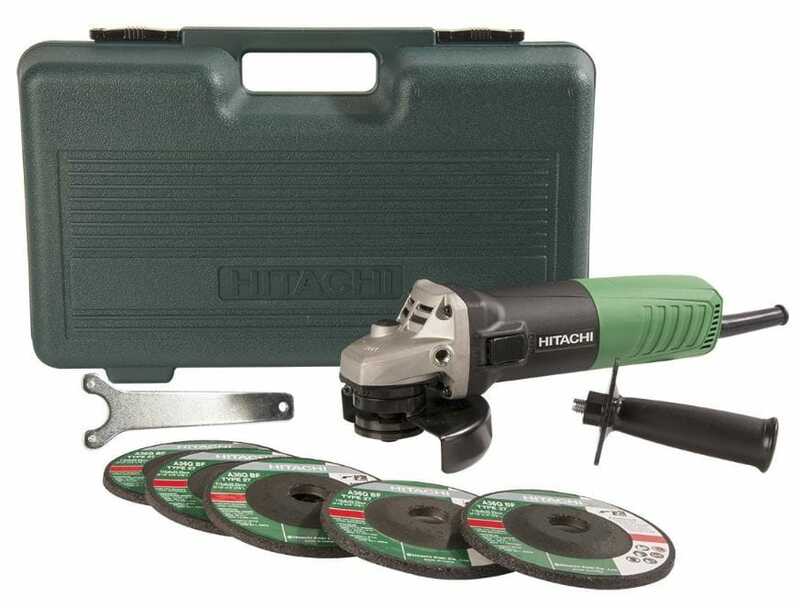 To complete the value bundle of this angle grinder, Hitachi provides many useful accessories such as five metal discs, one wrench, and a convenient plastic case. The Hitachi G12SR4 is a product that can exceed your expectations if you take into account the relatively low cost. Some people will recommend you a high-end angle grinder for any job but if you only need a solid all-around tool, you can safely go with this one and still reap some great benefits. A great assortment of features for the price. 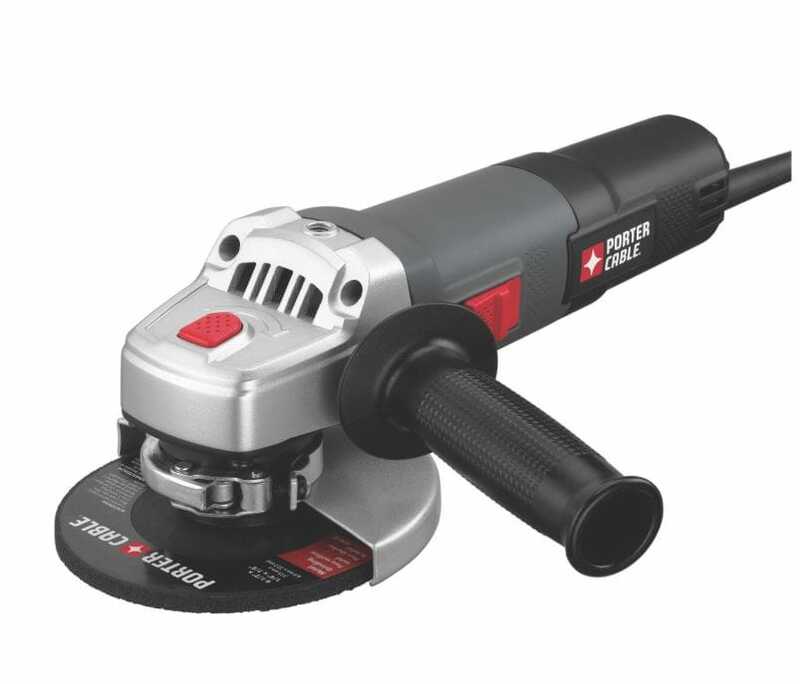 The PORTER-CABLE PC60TPAG is a decent budget option for anyone in need of a capable 4-1/2-Inch angle grinder. It can reach 11,000 RPM with its 7.0-Amp motor and boasts many convenience and versatility features. It’s designed for compact performance so let’s see if it’s worth the cost. With a weight of just 4.1 pounds, this is not like other bulkier angle grinders on the market. It can be successfully maneuvered by various professionals on the job site. Some of the best applications for which this tool can work well are grinding and polishing. It deals in an effortless manner with precision tasks such as metal cutting. The powerful motor of this angle grinder is housed in a metal gear for efficient heat dissipation. In terms of performance, it should be able to meet consumer and most industrial-level demands. To position it more effectively, the tool comes with a side handle that can be flexibly moved to your most comfortable place. A good level of control is achieved using the side handle, but another factor that offers its contribution in that regard is the paddle switch. It turns the tool off immediately in case of accidental dropping. There are two guards incorporated in this grinder, one used for cutting and the other for grinding. Adjusting them is done without having to get your toolbox out. Changing the wrench bits is done easily due to a spindle lock feature. There’s a modest range of accessories included in the package such as grinding and cut-off wheels, two different guards, side handle, and wrench. You have the option of purchasing extra accessories according to your needs. Considering the versatility, construction, and overall performance, the PORTER-CABLE PC60TPAG could be considered an attractive choice for an affordable angle grinder. It doesn’t come with too many fancy technologies, but it does the job done in a very efficient manner for the cost. For many people, this should count as a worthy investment. DeWalt has many powerful tools in store and one model that particularly stands out is the DWE4011. This is a small angle grinder designed to remove material quickly and effortlessly. It can reach 12,000 RPM and has many great abilities to simplify the operation process, such as One-Touch Guard. As this tool has a low profile, it’s able to deal with tighter spaces. Its jam-pot gear case makes this a durable option for an angle grinder. For extended use, having a slim tool like this one can make a huge difference in terms of comfort. The 7-Amp motor incorporated in this unit can work nicely in a wide variety of applications. It’s designed with durability in mind so that’s why the manufacturer included solid overload protection. This 4-1/2″ angle grinder is rated at 850W. A side handle which can be removed will take care of positioning to guarantee the most comfortable way to work and control the tool. When it’s time to change the wheel all you need to do is activate the Quick-Change release system which removes the wheel without having to waste time searching for tools. Thanks to One-Touch Guard, you can also adjust the location of the guard more conveniently. The 5/8″-11 spindle thread has the ability to accommodate various accessories. One disadvantage of this model compared to the previously reviewed DWE402 unit is that it lacks the efficient Dust Ejection System. Still, at this cost, this is a reasonable compromise. All in all, the DeWalt DWE4011 makes this list of best angle grinders because of its usefulness and reliability features. In the right hands, it can tackle many types of sharpening and cutting tasks. The fact that’s it’s smaller than other models can be advantageous for those with limited space to work. It this fits the bill if you want a decent angle grinder without spending more than necessary. Those who need to deal with demanding tasks in terms of precision should ideally try to get a variable speed angle grinder. One powerful example is the Makita 9565CV which is equipped with a strong 12-Amp motor that can be set more precisely with its variable speed control dial. Setting the RPM according to the material you’re working with is a very convenient feature if you deal with different tasks regularly. With the variable speed control ability of this angle grinder you can tackle polishing and grinding, as well as stone work. Set the 12-Amp motor between 2,800 and 10,500 RPM. One powerful technology included here is the Super Joint System, which has been developed by Makita. The way the system has been engineered has a great contribution to the prevention of gear damage, an issue that can often appear on these tools. Other excellent durability features are the zig-zag varnish and labyrinth construction that both act as seals for the motor keeping dust and debris out. When it comes to ergonomics, the angle grinder has some features to enable a more comfortable experience during continuous work. The unit weighs 4 pounds, which could be considered lightweight for an angle grinder. It’s fitted with a lock-on switch and a tool-free adjustment for the wheel guard. Finally, the side handle is flexible enough to be installed on any side you prefer. In conclusion, Makita did an outstanding job with the 9565CV. It’s a very performant angle grinder, definitely superior to other models on this list. The price is on par with its features, so expect to spend more to get to this level of quality. Anyone who needs a more professional angle grinder shouldn’t pass up what this capable unit offers. 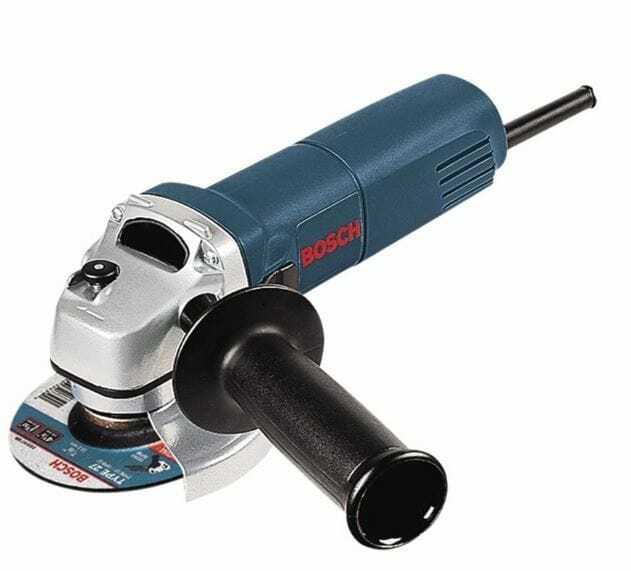 A decent all-around angle grinder comes from Bosch. Their 1375A model is a classic 4-1/2-Inch unit which offers fairly basic abilities at a level of quality that stands up to a brand such as Bosch. Some of the highlights include the compact design, versatile spindle, and the advanced Service Minder Brush System. This machine has been designed to be as compact as possible without sacrificing too much performance-wise. The 6-amp motor doesn’t blow anyone away, but its 11,000 RPM should suffice for most polishing and grinding jobs. One thing that makes the motor stands out is its great efficiency and the particularly small field diameter. Sometimes there’s a need for having the angle grinder operate on a continuous basis. Thanks to a lock-on switch conveniently placed at the side of the unit’s body, you can activate it to do precisely that. It’s crafted with durability in mind to resist everyday use and intensive work without requiring constant maintenance. Speaking of durability, this model has field windings coated in epoxy for protecting the grinder against metal debris and dust. In fact, the tool is designed to prevent debris from reaching the switch mechanism as the switch comes nicely sealed. This extends the life of the grinder and as an extra security feature, it also comes with a protective guard. The most important ability of this model is the signature system from Bosch called Service Minder Brush that boosts the longevity of the tool. It turns it off when it’s time to do some maintenance to it for preventing any emerging issues. Controlling this angle grinder can be done in a more fluid way with the removable handle that’s been strategically placed to be angled at the optimal position for comfort. While the grinder is excellent in all regards, this model feels a bit lacking in terms of available accessories. It’s not the most flexible tool out there but for most users, it can be said that the Bosch 1375A represents a valuable choice. The price is competitive for its class and the angle grinder is recommended for those who prefer a very easy-to-use tool.